When I first started prepping in around 2007 or so, water was a big concern…probably not as big as it should have been (I say this because almost every prepper I know puts off good water preparedness in favor of just about everything else, even though it should be done first! ), but I knew we needed some. When I was researching filters, storing water in 55 gallon drums or smaller, more portable container, pool shock, bleach and the like, I happened upon an article about the Lifestraw (sorry, the page this goes to is pretty ugly). It seemed so simple compared to many filters, such as the Katadyn Hiker Pro I’ve had for years. The sad thing was, the Lifestraw wasn’t available at retail (or online); the company that made it sold it only to NGO’s, charities and the like for use in the 3rd world. Respectable, but frustrating as it seemed like an auto-include in every bug out bag, food storage kit, 72 hour kit, and other types of go-bags. About twice a year I would check up on it in the hopes that it was available for sale. Until this year, it wasn’t. The good news? Now it is! Even better, we have it! I am so proud to introduce the Lifestraw, now available at Discount Mylar Bags. The Lifestraw is by far the easiest to use portable water filtration system ever designed. When I mentioned a few posts back that I wanted to carry only ‘best in class’ survival and preparedness gear, this is the type of item I was talking about. Some basic specs is that it reduces 99.99999% of waterborne bacteria and 99.9% of protozoan cysts (including giardia and cryptosporidium). It will filter over 250 gallons of water. And it is the easiest to use filter…just use like a straw (it will take some effort until the filter is wet). And at only 2 ounces, it will fit just about anywhere. Better yet, we have the Lifestraw at the Minimum Advertised Price if you buy 5. 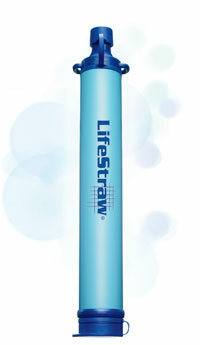 With our Free Shipping, that means we have the Lifestraw available at the absolute lowest price available. To be more specific, I’ve structured the cost to go down $1 for each additional Lifestraw you buy, so it’s only $23.95 for 1, $22.95 for 2, $21.95 for 3, $20.95 for 4, and $19.95 for 5.